At all my previous agencies, "doing some charts" was one of those jobs planner 'did'. 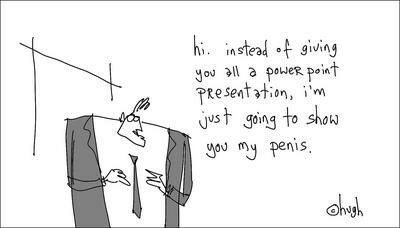 And though we may all like to think we're PowerPoint whizzes, and very clear, clever and entertaining when holding forth, in our dark (and honest) moments we would probably admit that all the white noise of words and numbers is just a bit boring (it's probably the slowly nodding off audience that give it away). Coming to Quiet Storm, where they'd never had formal planning before, meant none of that accepted wisdom was in place. Which is why we trying some different ways of doing things (not that they all work!). I very quickly got to the point of 'big pictures and minimal words' (is it only account people who want planners to do the graphs and numbers thing, whether they have a role or not?). But pretty as that may be, it's still one bloke pontificating, which isn't really the QS way. So at a recent pitch we decided to go really off piste. Rather than do strategy in the traditional format of 'lecture-from-the-front-that-ends-in-the-right-answer', we decided to walk the client through our thinking. Quite literally. We stuck everything on the wall, had people on their feet, and told the story of how we got to where got to in a more interactive style. Sadly, we didn't win! But for reasons of 'creative differences' we now clearly understand. The client loved the thinking tho, and and really liked how we did it. Which is nice. showing this from Hugh at Gaping Void, which made me laugh. Cos that's what a lot planning presentations are sometimes. A standing at the front and intellectually slapping it on the table, in an 'aren't I clever' fashion. But is that really what people want from us?